For our first Fewd Bite, we have Tabasco. Tabasco now has many different flavors available. We are focusing on the original Tabasco Pepper Sauce and Green Pepper Sauce. I think we can agree, both are awesome, but very different. If you are looking to add a little zip to your fewd, this stuff is perfect! The original has that spicy, acidic flavor along with a decent amount of heat. 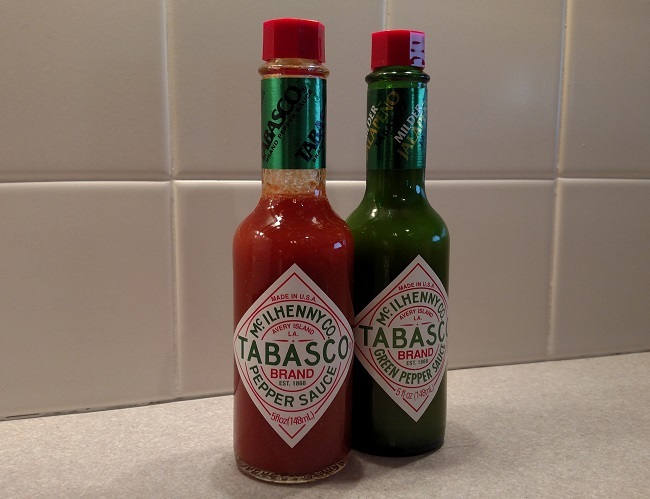 The more mild, green Tabasco has a unique pepper flavor. Both go great on anything from pizza to eggs. Hell, we bet if you put it on cardboard it would taste amazing! Denny’s Thoughts: First of all, I can’t stand vinegar. Vinegar reminds me of Easter eggs. There’s nothing wrong with Easter eggs, but I don’t want my food to taste like how they smell. And the funny thing is, the original Tabasco has a strong vinegar taste. Yet, there’s something about the taste of the pepper that makes the vinegar not bad. In fact, it’s great. I don’t get it. I never have. But Tabasco is good on everything. It has a “burn” that builds. You won’t realize it right away. What I like most is that it isn’t just “hot.” It has a good, strong flavor too. The jalapeno Tabasco, labeled “Green Pepper Sauce,” is equally excellent, but different. It doesn’t have the strong “burn” of the original, but it adds a great flavor to whatever it is put on. Both are perfect add-ons to whatever you are eating. Herman’s Thoughts: Anything that doesn’t have to be refrigerated, yet has a shelf-life of two and a half years (AND still tastes awesome) should be considered sorcery, and I think Tabasco qualifies. It is simply amazing.